Here is the finished version of the commission I created for an artist friend of mine. The top is the photo I worked with. 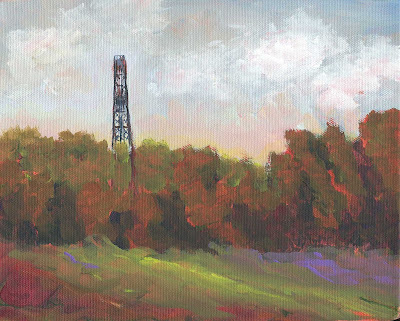 The derrick is leaning in both pieces, I just chose to lean it the way I felt the trees were blowing. 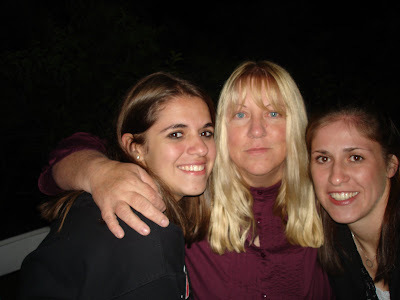 This is for you Marcee. 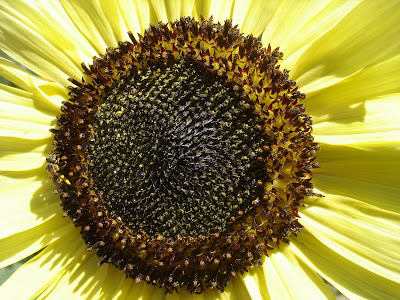 I took a bunch of sunflower pics from my friend and neighbor Marcee's yard this morning. They will definitely be developed into paintings for Artfest. I may have a daily painting tonight, but I just wanted to post this and say thanks to Marcee (and Manuel the gardener) for the beautiful display I enjoy from across the street! Hello everyone! It has been a long day. I picked up my paint-out packet and decided to start off at La Cienega, a village halfway between Albuquerque and Santa Fe. 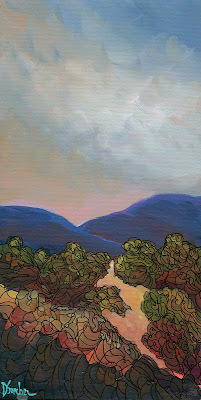 I painted a small painting, took lots of pics and continued on to the Turquoise Trail - the backroads between Albuquerque and Santa Fe. 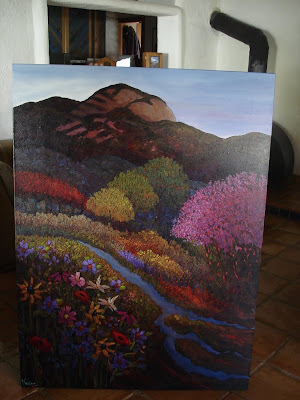 I painted in Galisteo, Cerrillos, and took pictures in Madrid and Golden. I was disappointed because they put a big chain link fence around the beautiful old church in Golden. All in all, I've decided I don't like painting on location in the heat of July and I don't like painting alone, but I don't know if I'd like anyone going with me either. 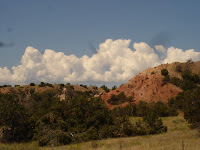 I saw lots of fantastic cloud formations along the way and I will be heading to Santa Fe on Monday to hopefully paint all day. I will finish my small commission tomorrow. This is a small commission for an artist friend of mine. 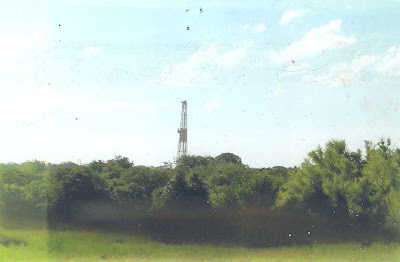 It's an oil derrick in Texas. This is about 60% completed. Tomorrow I will send the completed painting and the original photo so you can see what I had to work from. This is a painting I am working on for my sister-in-law. 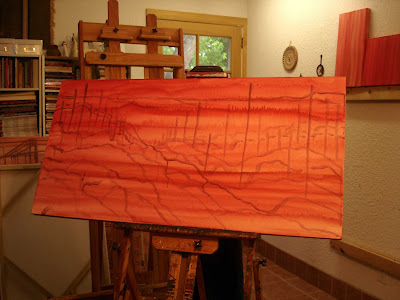 It will be a New Mexico vista with aspen trees. I am trying to have it finished in a couple of days, which means I am procrastinating at every opportunity. I think I just want this one to be really good, so I keep putting it off. I need some motivation!!! 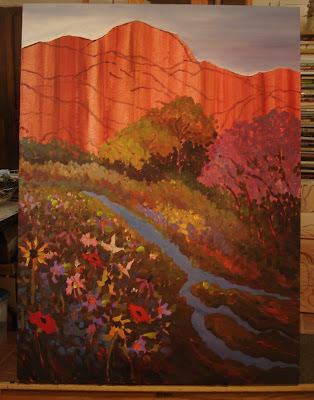 Tomorrow I am headed to Santa Fe for the New Mexico Plein Air Society's five day paint out. I won't be going every day but I am planning on doing a lot of painting on location over the next few days. There will be an exhibition of 60 artist's plein air work (including mine) on August 2 at the Mark Zoeller Gallery on Canyon Road in Santa Fe. I will provide more details later. This is another painting for the Animal Humane Association. I'm working on two commissions, plus a painting for the National Hispanic Cultural Center , and a special aspen painting that has been almost two years in the making for my sister-in-law for her wedding present (she already has a baby, boy am I behind schedule!). I will try to have another daily painting tomorrow night. 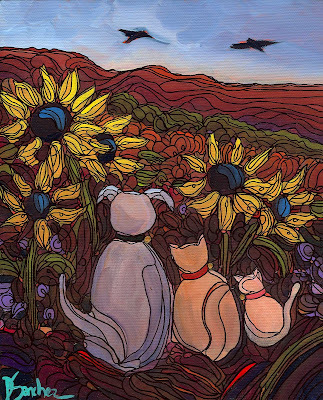 This painting is a small piece created for a fundraiser being hosted by the New Mexico Animal Humane Association in August. I love animals so much. I don't normally paint them, but I knew I wanted to incorporate some of my "style" into the painting. This is what I came up with. I picture them waiting for their master to come home and they're just hangin' out, watching the birds. Notice they also have their collars and tags. I really love aspen trees. They are plentiful in the mountains of New Mexico. I don't paint them as often as I'd like because it takes so long to do the line work. I am working on two small commissions and I will post thsoe in the next couple of days. 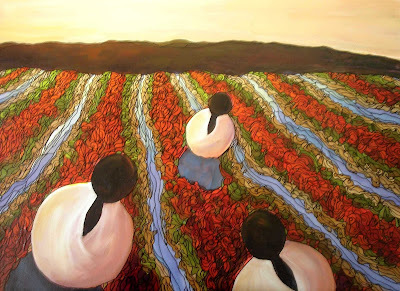 When I think of the New Mexico fields of chile being irrigated from the acequias, I always think of women doing the work. I don't know why. I picture them working together, growing crops, harvesting, drying chile ristras, cooking and doing everything necessary to bring food to the table for their families. This is a larger painting than I normally post. I hope you enjoy. We are off to see the new movie tonight and will have our heads buried in the newest book for the next few days. I absolutely love all of the books and am so sad that there will be no more. I can't wait to find out if Snape is good or evil. This is one of those scenes that I love. 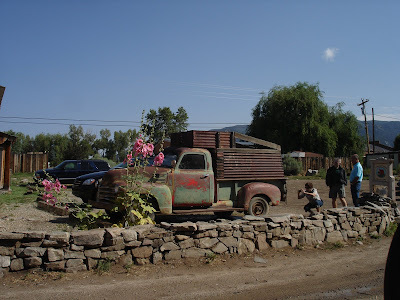 An old truck parked in Arroyo Seco , complete with hollyhocks and a backdrop of mountains. The people were taking a photo of the license plate for some reason. I was getting breakfast burritos from the Abe's Cantina, home of the absolute BEST breakfast burritos in New Mexico and probably the world! This is another free form daily painting. I just finished a large piece that had three trees and I guess that's where my thoughts went. There could be heavy clouds over the mountains or it could be the last light of day. The red shining from beneath the orange is the color I tone my canvas before painting. I'm happy with this one. Oh, and my show...I had four paintings left. Out of 53. All sizes. This show is so fun. The doors open at 10am and they said someone came at 11pm the night before and spent the night in order to be the early bird. By 12pm the walls were empty. Good thing the gallery only does this once a year! See you tomorrow. I felt a need to do something free-spirited today and this is what happened. 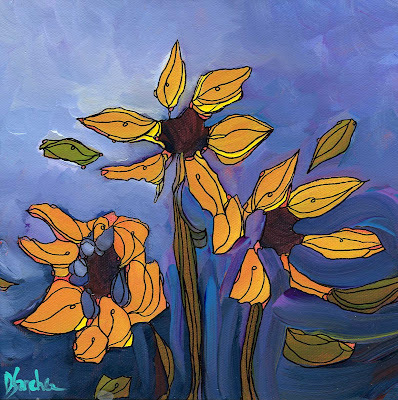 I love these sunflowers - I felt like I was just throwing paint on the canvas and I love the result! 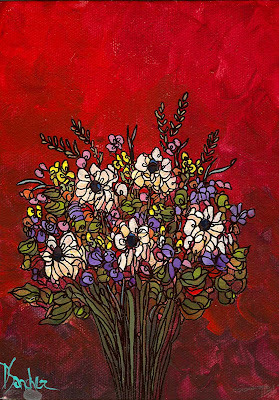 This is a small little spring bouquet up for auction. I am hoping to complete a daily painting every day for the next two weeks. Still finishing up commissions, will keep you posted....Oh, and I hear the show turned out great. I'll find out more tomorrow! Hi all! Just got back from Taos and it was beautiful! I will post a photo tomorrow of a church that will become a future painting. The wedding was great, although it poured on us all when the bride and groom were saying their vows. This is a photo of the finished painting I was working on. 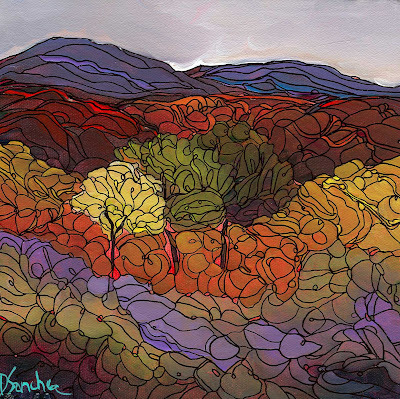 I have several commissions to finish this coming week and then I plan to head back up to Taos for more painting. 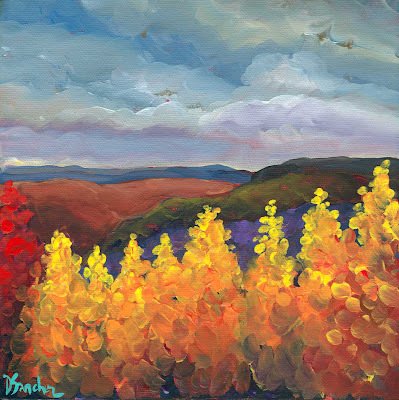 This painting was a small 8"x8" daily painting sold at auction. I have been commissioned to paint a 24"x48" piece similar in design. It will be an anniversary present. It should be fun and I will post the design and painting progression in my daily blog. 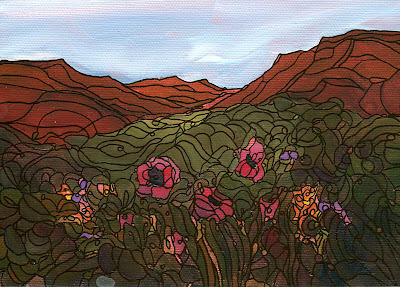 This is a small painting called "Poppy Canyon" that will be in Saturday's show. It's a 5"x7" was fun to do. I've been working on such a large piece that painting something this small was a nice break. I finished the large Taos painting and will post photos on Monday. One day only and get there early. Tomorrow is preview day. You can look but not buy. This is one of the commissions I'm working on right now. It's 40"x54" and is a composite of Taos favorites. There is El Salto, the Taos Mountain in the background. The middle ground consists of vegetation, fruit trees, and an acequia flowing through the scene. 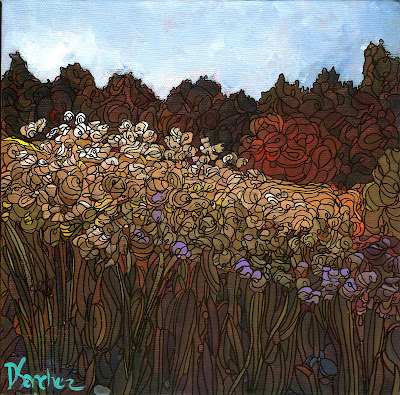 The left side is a meadow of flowers overlooking the whole vista. This is the underpainting in progress. Hi everyone, we had a big lightening storm two days ago and it knocked my internet out. It should be back up tomorrow. I'm borrowing a computer. I have been busy at work on commissions and paintings for the Weems show. I took 38 pieces to the gallery today. Several are large and there are lots of smaller sizes. Everything at this sale is $285 or less. It's such a fun show. Anyway, if you're out and about, the show features 16 artists and will be at Weems Gallery, 2801 Eubank NE, Albuquerque, NM 505-293-6133. Talk to you tomorrow! I meant to have a daily painting tonight but there's just been no time. Here are two pieces that will be in the Weems Summer Show. One is a cloudburst that I love and the other is from a photo I took in the fall up in Taos. I will post more tomorrow. I'd like to get another small piece done for tomorrow night. Right now, I'm getting ready to go watch my daughter's dance show. It's a big performance outdoors and they'll be doing jazz and hip-hop. Maybe I'll break out a few dance moves myself! 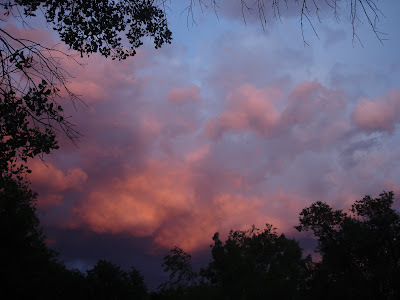 I snapped this gorgeous photo of clouds outside my house a few nights ago. The image changed from moment to moment but this was my favorite shot. An incredible sunset! And right in my own backyard. These are my babies. When I first started painting, these were my first creations. 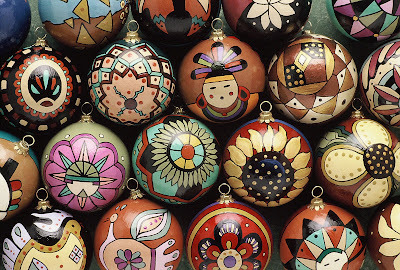 I still paint ornaments; imported, unbreakable, and my own one-of-a-kind creations. I have four full sketchbooks of designs! I only offer ornaments from November - Christmas because they're time consuming and my time is definitely limited these days. I hope to have about 30-45 completed in time for Weems Artfest in November. I'm working on commissions this week, I hope to have a new small painting tomorrow night. I love this painting. It's a smaller version of the first grass painting I did a year or so ago. 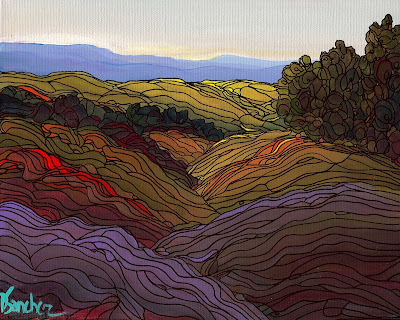 I love the painterly sky and the deepness of the grass at the bottom of the piece. I also like the little touches of purple. A very peaceful but moody autumn day in New Mexico. I love painting clouds and this just reminded me of teh end of a beautiful day, maybe taking a meandering walk down this pathway and enjoying the sunset.